Ahead of the recently wrapped 2012 Mobil 1 Twelve Hours of Sebring, the converted World War Two airport strip turned race track played host to a test for what is the subject for the revolutionary 'Project 56'. A prototype sports car racer, the DeltaWing turned its first public laps around the Sebring International Raceway on March 15th as part of the vehicle's training for the 24 Hours of Le Mans in June. Attracting a sizable crowd, the ultra-lightweight, highly distinctive prototype set for several laps under the momentum of a Nissan powerplant. In a recently published YouTube clip posted by Nissan, the phrase "incubator for innovation" is an appropriate description for the DeltaWing 'Project 56' sports car racing development. As the race car lapped the Sebring road course, the Nissan DeltaWing's roughly one-half reduction in horsepower over traditional race vehicles coupled with the one-half drop in weight should potentially equate to lap times close to current prototype class cars in the FIA World Endurance Championship. 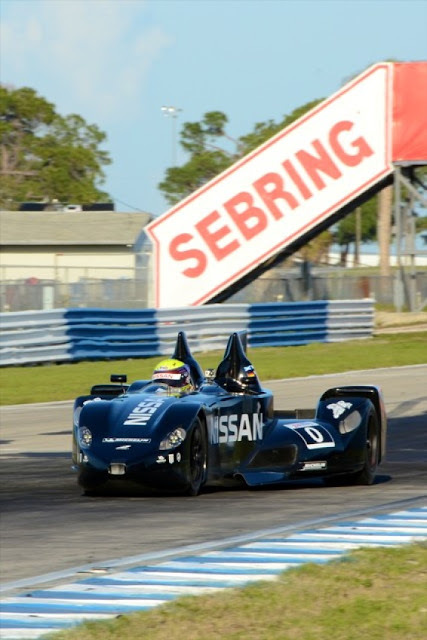 While the Sebring test was mostly exploratory without any official track times, the Nissan DeltaWing showed stability and drivability many critics of the race car were not expecting to see on track. Along with reduced fuel economy, Nissan DeltaWing engineers express that the lighter race vehicle will apply less mechanical stress to components such as tires and brakes. This fact for the Nissan DeltaWing should present some drastically different servicing at the 24 Hours of Le Mans. Nissan interest in the DeltaWing 'Project 56' initiative stems beyond the race track. The Japanese auto company believes the principles being exercised through the Nissan DeltaWing race car research and development can benefit future production cars for the street. General Manager of Nissan Europe Darren Cox explains, "It's a fantastic project for Nissan." adding "All of the stuff we learn from this project we are going to be able to cross into road car development,". Included below is the YouTube video log Nissan posted on the DeltaWing chassis being put through its paces at Sebring International Raceway.